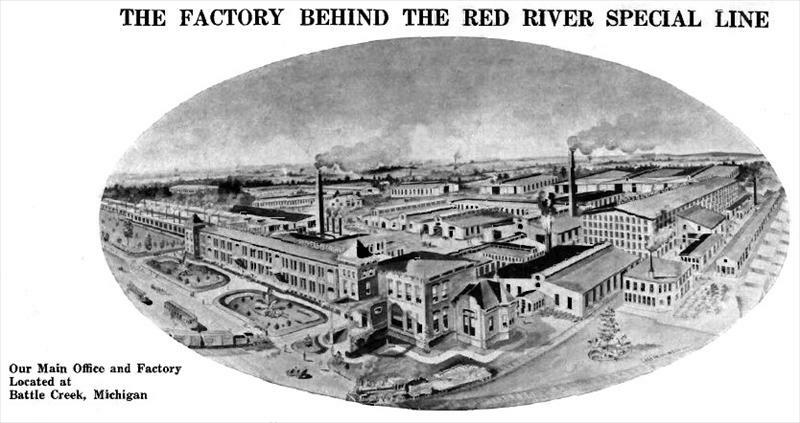 Nichols, Shepard & Company was organized in 1848 by John Nichols and David Shepard in the city of Battle Creek, the former being a practical moulder and the latter a machinist. The business has grown from its insignificant beginning into an institution that now manufactures about one-tenth of the threshing machinery used in the United States. The total floor space of the factory approximates forty acres. The company employ about 500 workmen with a pay roll amounting to nearly $250,000 annually. The successful and progressive growth of the institution has been gradual without any seeming cessation. The product of the institution at present consists of traction engines, threshers and their attachments, including stackers, self-feeders, grain weighers, etc. The principal sales of the company is in the grain growing states, although a large portion of its product is sold in the Canadian Northwest, with considerable export business to Mexico and South American countries. One peculiar feature of this institution is that nearly every foreman and industrious, loyal employee is a stockholder in the company. The success of the institution has largely been the result of the effort directed by its present president and general manager, Mr. Edwin C. Nichols, who has been with the institution from boyhood. They were known to have been a manufacturer of steam traction engines, the Red River Special thresher, rice threshers, alfalfa and small seed threshers, mounted water tanks, low down tank pumps, and all-steel frame horse powers.